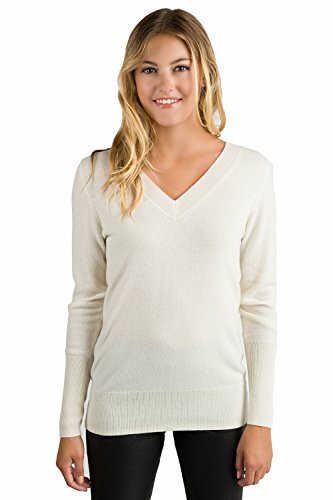 Cozy up a stylish season with this timeless JENNIE LIU Women's 100% Cashmere Long Sleeve Ava V Neck Sweater crafted in a slightly longer flattering silhouette.Indulge superior softness with this elegant modern v neck sweater densely knitted in premium cashmere. tightest settings on an 12 Guage makes this 2-ply cashmere sweater substantial without being bulky. Easy and cozy anywhere without adding extra weight. Substantial 12 gauge knit with tightly twisted 2-ply yarns in the finest cashmere exquisitely from Inner Mongolia. Modern ribbed v neck line in just the right depth, perfect to wear alone, or to layer with anything. Superior soft and ultra cozy, substantial yet not bulky. Highest pilling perfromance of its class. [scroll over towards the bottom of the product images in each color to find the exact measurements chart ]. Modern ribbed v neck line in just the right depth, perfect to wear alone, or to layer with anything. Simplicity, easy spirit, superior authentic quality in gorgours details. Very affordable with long lasting performances. 25 years one product - cashmere is all we do at JENNIE LIU. Conveniently based in Los Angles California, serving millions of smart & happy customers with supreme quality products at the right prices. JENNIE LIU is a registered trademark with USPTO, we never authorize any third party to sell our branded products. Please only buy products SOLD BY JENNIE LIU FULFILLED BY JENNIE LIU or SOLD BY JENNIE LIU FULFILLED BY AMAZON. If you see third party listing, report to us and Amazon Customer Service.